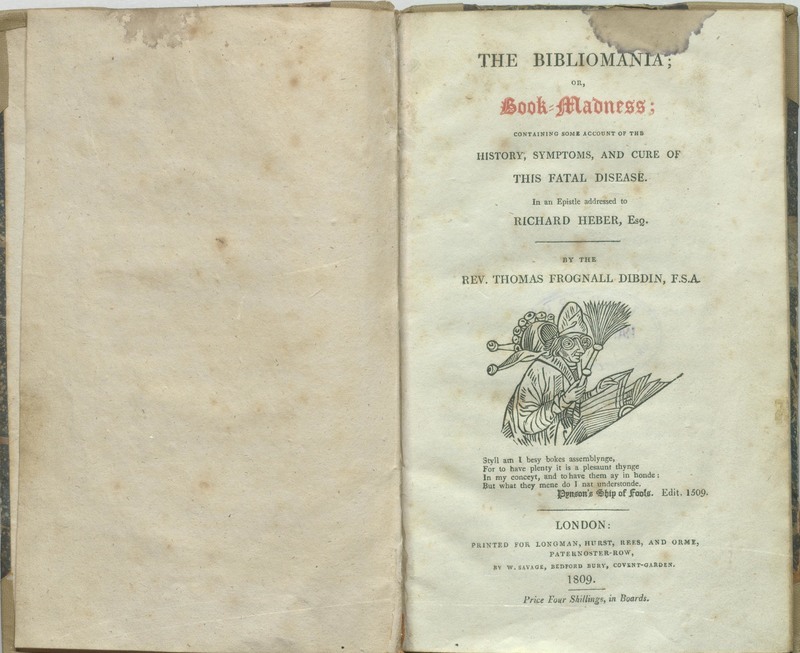 Have you ever heard about an illness called Bibliomania? Neither have I. Yet, this dark desire for books infected Europe in the 1800s. Book lovers and collectors feared becoming a victim of the pseudo-illness. Book collectors and bibliophiles described “bibliomania” as a medical condition. “Any obsession can become real disease,” says David Fernández, rare book librarian at Thomas Fisher Rare Book Library at the University of Toronto. The social elite and scholars did everything they could to obtain and collect books—no matter the price. Some collectors spent their entire fortunes to build their personal libraries. 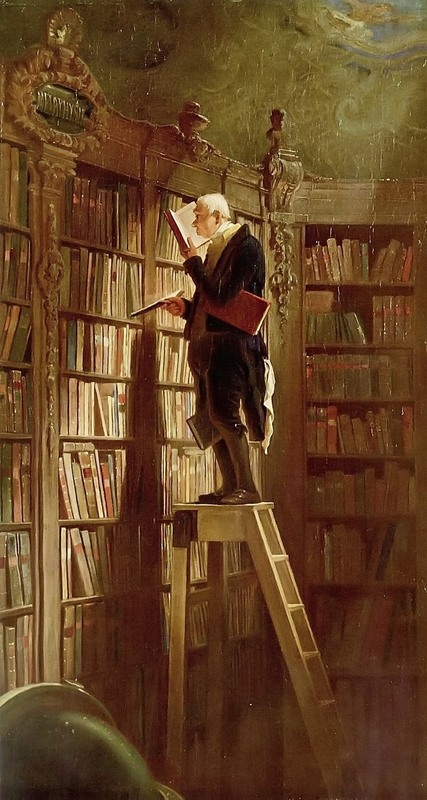 While it was never medically classified, people in the 1800s truly feared bibliomania. There are several written accounts, fictional and real, of bibliomania, but the most famous and bizarre documentation is by Reverend Thomas Frognell Dibdin, an English book lover and victim of the neurosis. 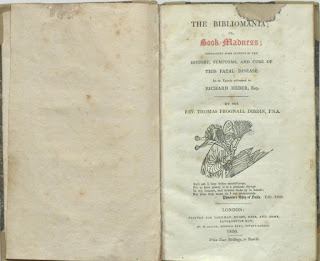 In 1809 he published Bibliomania - or Book Madness- a series of strange, rambling fictional dialogues based on conversations and real collectors Dibdin had encountered. David Fernández , speaking about this book states, “I think a very good word to describe the book is that it’s very bizarre.” He says it after studying his library’s preserved copy of the 1809 first edition. “It’s a product of the generation in which it appears.” On the title page of the book, an engraving depicts a “book fool,” a character originally featured in the 1498 book, Ship of Fools, the first work of fiction to reference the discovery of the new world. That character is described as a vain book collector, the story touching on madness among scholars and collectors, explains Fernández. According to Reverend Dibdin, the author of this strange book, the “book-plague” had reached its height in Paris and London in 1789. After the French Revolution in 1799, French aristocrats sold their estates to flee from the country and many private libraries emptied their shelves. Men and some women collectors purchased books to conserve and preserve Europe’s literary heritage, while others did so as a symbol of wealth and power. At this time, constructing books was a delicate and laborious art completed by hand—from cutting the paper to creating the binding—which added value. 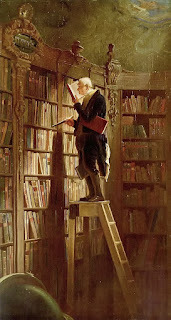 Dibdin points out eight particular types of books that collectors obsessed over: first editions, true editions, black letter printed books, large paper copies; uncut books with edges that are not sheared by binder’s tools; illustrated copies; unique copies with morocco binding or silk lining; and copies printed on vellum. Reverend Dibbin’s Bibliomania was widely popular among Dibdin’s fellow book lovers, with collectors getting in reckless bidding wars at auctions over a copy. The book is said to have spurred a 42-day auction at the 1817 Roxburghe sale. This is a fascinating post, Carmen. Who'd a thought. YOU have a great day, my friend. I'm glad you enjoyed the post, Sandra! Thank you for checking it! Yes, I have it too. Oh my goodness, I love love love that picture of the man among all the book treasures. I'm sure you do, dear Flossie. Entering a library or even a bookshop has always been for me a great pleasure. I always consider I don't have enough books. Though, I have paper end e-books to read three lives! Thank you for checking it and leaving a comment, Craig! Wow, how bizarre that bibliomania was classified as a disease. I can see where the hoarding of books could be related to OCD, but what a wonderful form of OCD to have, LOL. I definitely love books, so I guess I am a victim. Indeed, Mae! A wonderful OCD. I think all authors suffer of this illness. I wish it were the only illness we are affected by. Thanks for checking my post! Just stopped by to say, Hey Carmen:) and wish you a great weekend. Thank you, Sandra! I am glad you enjoy my posts. There are several, back, Mysterious Romania posts, about strange happenings around here, if you like this kind of stuff. A lovely weekend to you, too!